Azure Key Vault is a cloud service that provides a secure store for secrets. You can securely store keys, passwords, certificates, and other secrets. Azure key vaults may be created and managed through the Azure portal. In this quickstart, you create a key vault, then use it to store a secret. For more information on Key Vault, review the Overview. In the Search box, enter Key Vault. From the results list, choose Key Vault. On the Key Vault section, choose Create. Name: A unique name is required. For this quickstart we use Contoso-vault2. Under Resource Group choose Create new and enter a resource group name. In the Location pull-down menu, choose a location. Leave the other options to their defaults. After providing the information above, select Create. Vault Name: In the example, this is Contoso-Vault2. You will use this name for other steps. 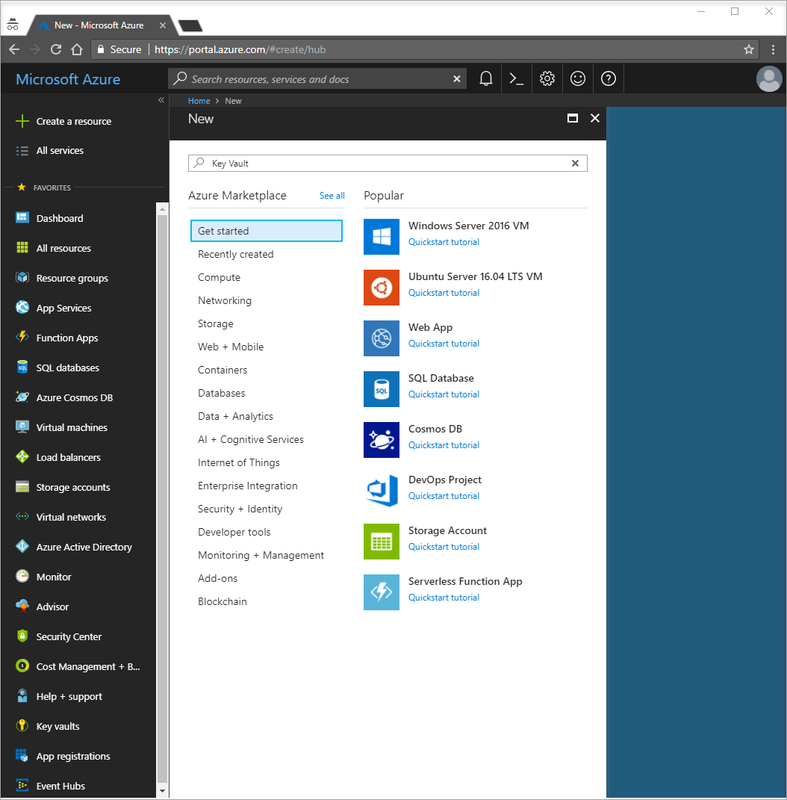 Vault URI: In the example, this is https://contoso-vault2.vault.azure.net/. Applications that use your vault through its REST API must use this URI. At this point, your Azure account is the only one authorized to perform operations on this new vault. To add a secret to the vault, you just need to take a couple of additional steps. In this case, we add a password that could be used by an application. The password is called ExamplePassword and we store the value of hVFkk965BuUv in it. On the Key Vault properties pages select Secrets. Leave the other values to their defaults. Click Create. Once that you receive the message that the secret has been successfully created, you may click on it on the list. You can then see some of the properties. If you click on the current version, you can see the value you specified in the previous step. By clicking "Show Secret Value" button in the right pane, you can see the hidden value. Enter the name of your resource group in the Search box at the top of the portal. When you see the resource group used in this quickstart in the search results, select it. In the TYPE THE RESOURCE GROUP NAME: box type in the name of the resource group and select Delete. In this quickstart, you have created a Key Vault and stored a secret. To learn more about Key Vault and how you can use it with your applications, continue to the tutorial for web applications working with Key Vault. 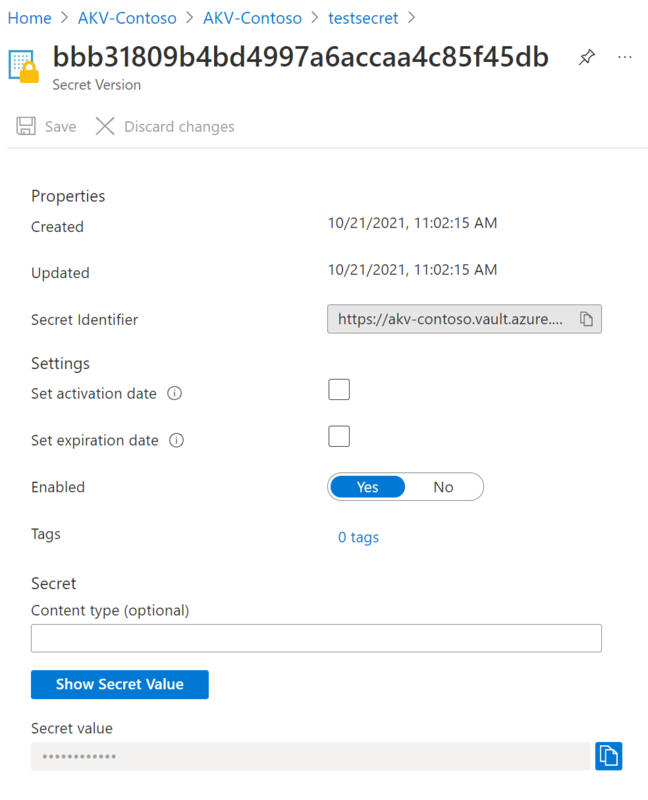 To learn how to read a secret from Key Vault from a web application using managed identities for Azure resources, continue with the following tutorial Configure an Azure web application to read a secret from Key vault.